A key goal USA-NPN is to provide opportunities for lifelong learning about the environment through observations of phenology. 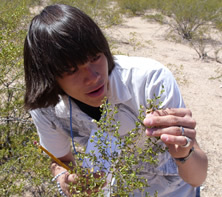 Citizen science and education activities are focused on the educational needs of K-12 through university students, as well as the general public. • Effectively communicate value of phenology and USA-NPN. • Develop and implement phenology educational and outreach materials that engage students and citizen scientists. • Work and collaborate with existing phenological education programs to expand and improve phenology programs. • Cultivate a sense of community among learners and observers, and pride in their contributions to scientific knowledge of phenology. • K-12 students: start by focusing on one grade level. • Undergraduate students: develop modules to incorporate phenology in ecology, forestry, geography, climatology, statistics. • Graduate students: develop graduate course(s) and self-directed studies. • Courses for adult learners and non-traditional students. • Interpretive programs of national parks, nature centers, museums, and botanical gardens. Engaging the general public as observers/reporters. USA-NPN can provide instructional materials via web or paper. These would include instructions for registration, selection of location to observe and species; recording of phenophases, environmental details (weather, slope, aspect, geolocation), how, when where of reporting. Other materials would be regular feedback to observers including visualization of data (graphs, charts, pictures, interactive maps, newsletters ideally twice a year). Sense of community and teamwork is enhanced through sending observers an annual list of regional observers. Recognition items can include pins, certificates, color photographs on stickers, refrigerator magnets etc. Communication among observers in both formal and informal education communities will be encouraged to foster and nurture the development and sense of interconnection among the different learning communities. One of the first successes of the Citizen Science and Education Working Group was to obtain funding and implement Project Budburst. Project Budburst is a nation-wide program that encourages students to record when plants first leaf out and bloom. The BudBurst site facilitates recording of phenological observations, and provides background on phenology and the project. Project BudBurst is a collaborative effort of the Chicago Botanic Garden, Plant Conservation Alliance, ESRI, the National Science Foundation, the USA-National Phenology Network, the University Corporation for Atmospheric Research, The University of Arizona, the University of Montana, the University of California, Santa Barbara, the University of Wisconsin-Milwaukee and the University of Wisconsin-Madison. The U.S. Bureau of Land Management, the National Science Foundation and Plant Conservation Alliance provided funding for the spring 2007 event. Project BudBurst grew out of a workshop held October 2006 at the University of Wisconsin-Milwaukee. The U.S. Fish and Wildlife Service, U.S Geological Survey, National Science Foundation and NASA funded the workshop. Project BudBurst is part of the USA-National Phenology Network, a consortium of scientists, natural resource managers and database and web application developers. The network's purpose is collecting and analyzing data and making it publicly available to better understand and adapt to changes in the environment. Visit http://www.budburst.org for more information on Project Budburst.